ICS Financial Systems Limited (ICSFS), the global software and services provider for banks and financial institutions, announced that Al Mustashar Islamic Bank, a recently established bank in Iraq, is now operating on its multi-awards winning Islamic banking software suite ICS BANKS ISLAMIC. Al Mustashar Islamic Bank is a newly registered bank in Iraq that obtained approval of the Central Bank of Iraq in the second quarter of 2018, to offer Shariah-compliant banking services. ICSFS have successfully launched and rolled-out its universal Islamic flagship and awards-winning banking and financial solution ICS BANKS ISLAMIC in a record-breaking time of only 3 months, where Al Mustashar will be implementing ICS BANKS ISLAMIC Core Banking System, Credit Facilities & Risk Groups, Murabaha, Musharaka, Ijara, Mudaraba, Qard Hasan, Time Deposit, Profit Distribution, Remittances and Trade Finance. “We are delighted to have become part of ICSFS expanding customers. As a newly established bank, we are looking for innovative and bespoke Islamic banking solutions to help us stay ahead in this highly competitive market. Working on ICS BANKS ISLAMIC will enable us to open new opportunities, to streamline operations and drive growth following the principles of Shari’a.” Alsaadi added “ICSFS’ wide experience and remarkable worldwide success and specifically in Iraq is one of the many key incentives for choosing ICSFS as our technology partner “. ICSFS invests in its software suites by utilising modern technology in launching new products, constructing a secured and agile integration, and keeping pace with new standards and regulations worldwide. 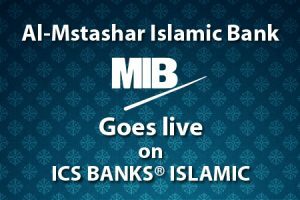 ICS BANKS ISLAMIC is a modular fully integrated solution designed and developed following the principles of Shari’a in compliance with the Accounting and Auditing Organisation for Islamic Financial Institutions (AAOIFI). ICS BANKS ISLAMIC software suite future-proof banking activities by providing a broad range of features and capabilities with more agility and flexibility, to enrich customers journey experience, hence improving the trust and confidentiality between the customer and the bank. ICS BANKS ISLAMIC has always been a pioneer in utilising the latest technology to serve financial institutions. In addition to its embedded Service-Oriented-Architecture (SOA), the system can be deployed on premises or in the cloud.